Do you have lots of scripts that you only use once in a while cluttering up your menus or workspace? 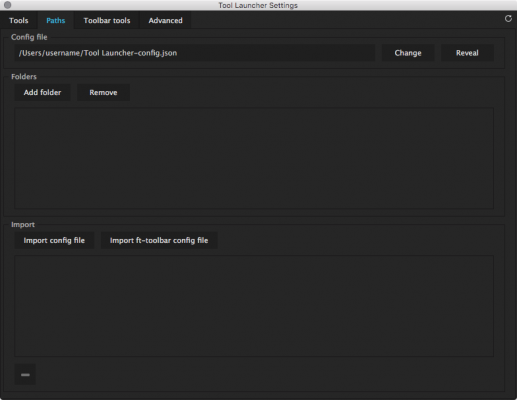 Tool Launcher lets you launch scripts whenever you need it without having to deal with floating windows that get in the way. You free up your workspaces and window menu, but can still have the scripts docked and quickly available. The best of both worlds! 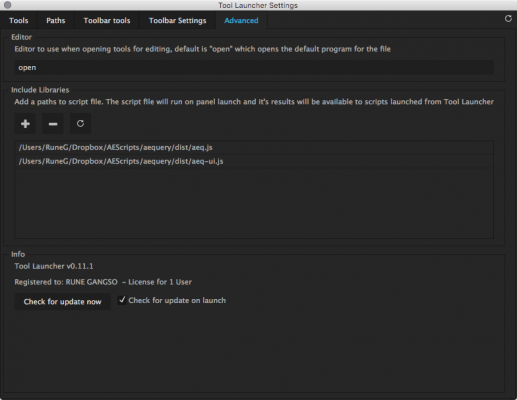 Tool Launcher comes with tl_panel, which when opened looks like an empty panel, but paired with either tl_list or tl_bar, this panel can show any script UI panel with a click of a button. tl_list also comes with a trick of it own, as most scriptUIs can be shown in this panel as well. So now you have two panels that can be customized to show whatever you like, whenever you like. Load folders with scripts and place them in a searchable list or in dedicated toolbars. Show interfaces for scripts, that normally has to be in the ScriptUI folder/Window menu, in pre-docked panels. 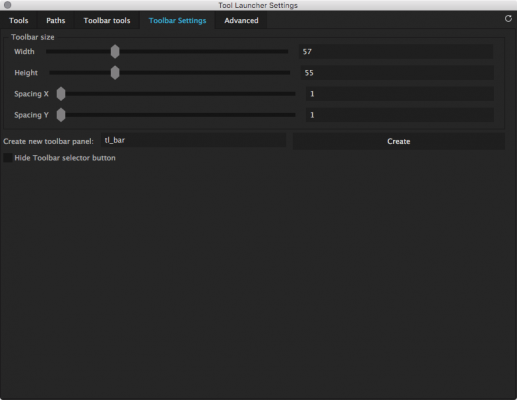 tl_bar: Customizable toolbar panels. Can be duplicated to have multiple toolbars. Create shareable config files with tools already configured, with modifier keys, icons, and toolbars. Set icons for toolbar buttons. One central settings window to customize all options, tools, and toolbars. Store the config file in any location. Copy the config file between computers and all your settings, icons and toolbars, will be included. Script: A script file to run. Expression: An expression that can be applied to all selected properties. 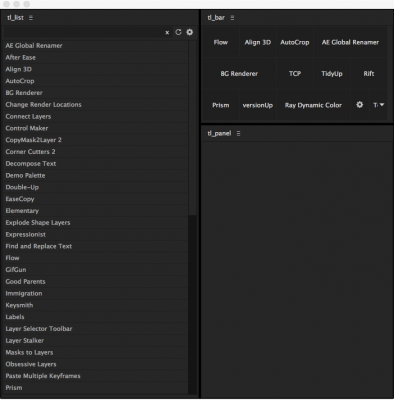 Menu Command: Any command from After Effects menus. 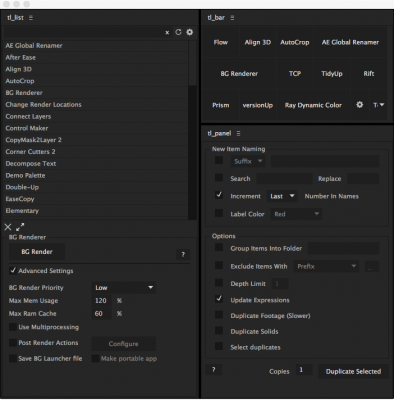 - Adds ability to apply Animation preset files to selected layers with command type "Animation Preset"
- Adds "Show only icon" button in Toolbar settings. This hides the button outline on buttons with icons in the toolbar. 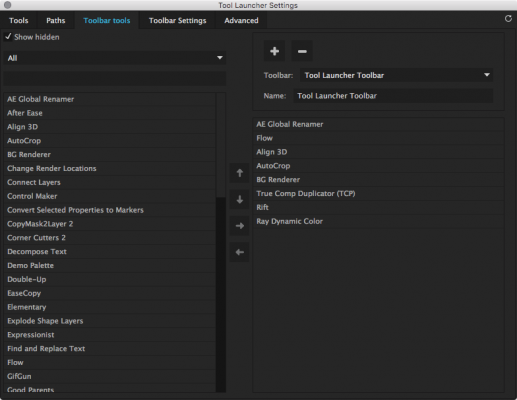 - Creates an "Undo" to undo applying effect or expression to multiple layers or properties. - Shows list of Icons that could not be written correctly, instead of showing nothing. 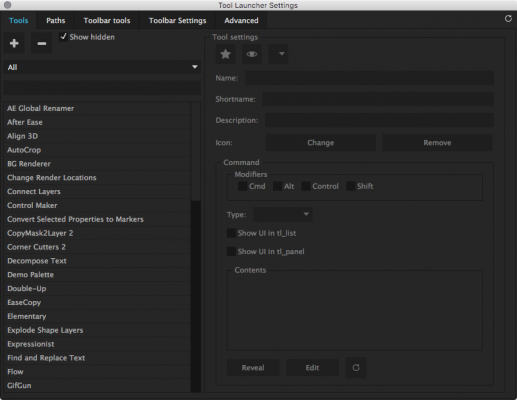 - Can now use left and right arrow keys to add and remove tools from toolbar in toolbar tools settings. Work in Stereo 3D without compromise. If you can do it in 2D, Evil Twin can do it in stereoscopic 3D.